While street artist Banksy remains a unidentified, the mystery man has been allegedly constructing a massive pop-up theme park under the guise of filming a Hollywood movie. 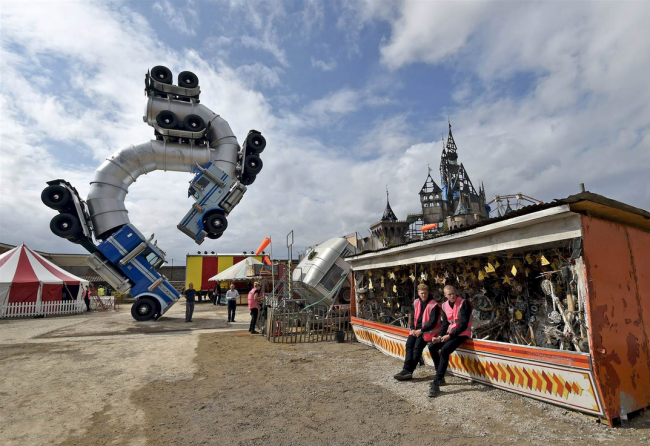 Dismaland, which opened this August on the seaside resort-town in Somerset, England, is the name of Banksy’s gloriously subversive theme park. 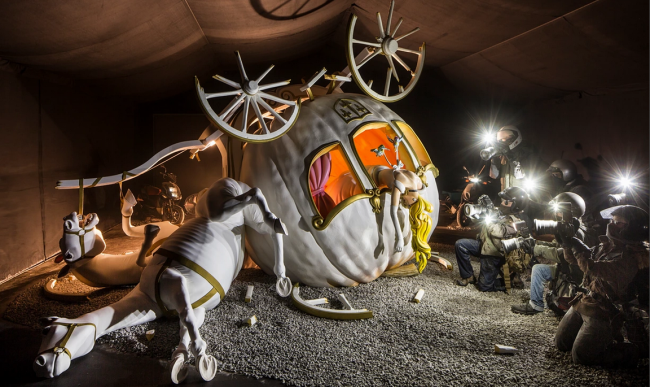 Drawing a crowd from all around the world, Dismaland puts a sinister twist on Disneyland, crossing the boundaries between hilarious, eye-opening and occasionally breathtakingly shocking. 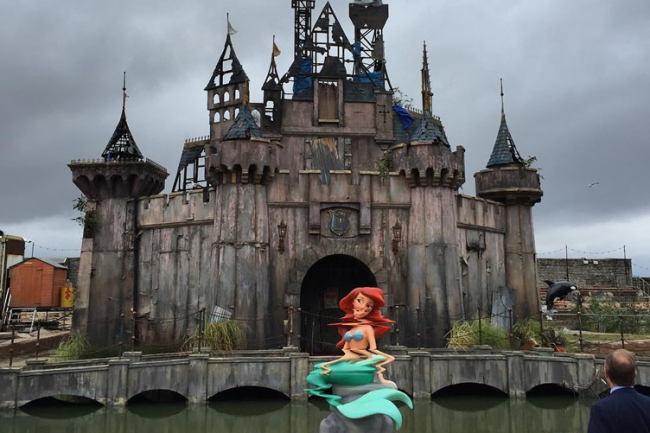 Dismaland includes a pink dystopian version of the Magic Kingdom’s Cinderella Castle, a horse-like sculpture, an S-shaped gas tanker, and various other oddball attractions. In one tent anarchists can find out how to unlock the Adshel posters seen at bus stops. For £5 people can buy the tools to break into them, replace official posters with any propaganda they please and “It’s not illegal,” says the vendor. cross the way is a “pocket money loans” shop offering money to children at an interest rate of 5,000%. In front of its counter is a small trampet so children can bounce up to read the outrageous small print drawn up by artist Darren Cullen. Works installed across the 2.5 acre Disney trolling play land were hand picked by 58 contemporary artists including Damien Hirst, Jimmy Cauty and Jenny Holzer. 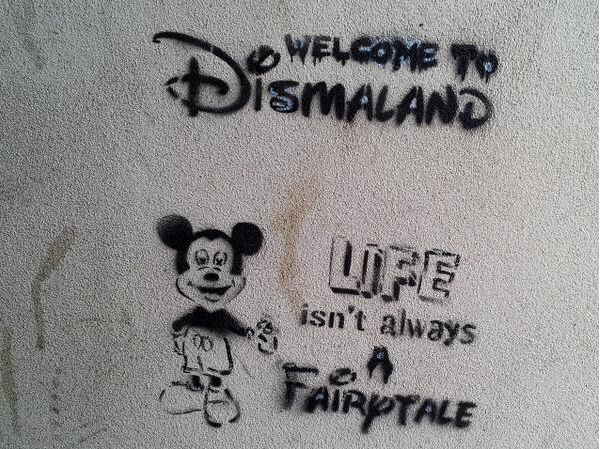 The name “Dismaland,” meanwhile, comes from a Banksy authored piece of graffiti that’s from as far back as 2012, which may indicate that this project has been in the works for quite some time. Other highlights include the Jeffrey Archer Memorial Fire Pit where visitors can warm themselves around a daily burning of the local lord’s books; a model boat pond with dead bodies and overly crowded boats full of asylum seekers; and a puppet revue show constructed from the contents of Hackney skips. Organizers say the show will offer an escape from mindless escapism. What does it all mean? “I guess you’d say it’s a theme park whose big theme is – theme parks should have bigger themes,” said Banksy. 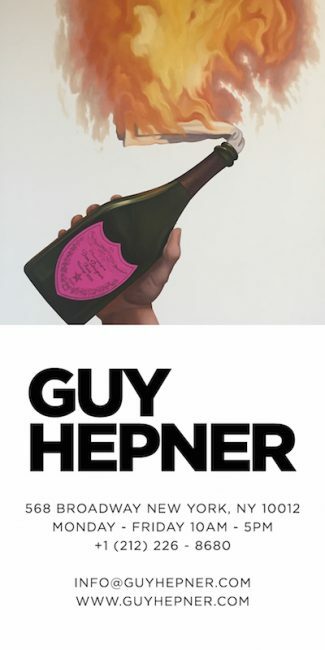 Guy Hepner is pleased to present Banksy artworks, sculptures, street art, graffiti, canvases, and paintings for sale. Inquire about prices to buy Banksy art.